In the event that you've just emerged from a coma, here's a headline for you: Super Heroes are very hot right now. Of course, they still rule comic book, but those costumed characters have taken over at the movies and on television as well. With this onslaught of projects, it's obvious that all of them can't be good. In fact, many of them aren't good at all. Which raises the question, what makes one of these entries work? Stars? Special effects? Paul Rudd? In the case of the The Flash, it's heart. Sure the show offers action, but it makes you care about the characters and their motivations. This continues in the show's second season. In Season One of The Flash, police forensic scientist Barry Allen (Grant Gustin) was struck by lightning at the exact moment that Dr. Harrison Wells (Tom Cavanagh) was experimenting with a particle accelerator. This caused Barry to suddenly have super-human speed, and he became the crime-fighter known as The Flash. With the help of Dr. Caitlin Snow (Danielle Panabaker) and Cisco Ramon (Carlos Valdes), Barry becomes the protector of Central City. One of the side-effects of Barry's power is that he can travel through time and between alternate universes. Season 2 really capitalizes on this, beginning with the appearance of Jay Garrick (Teddy Sears), who is The Flash on another version of Earth. This leads to the appearance of Zoom (voiced by Tony Todd), a black-clad version of The Flash who seems determined to take Barry's power. While The Flash contends with the meta-humans which Zoom sends from his universe, Barry begins a relationship with police detective Patty Spivot (Shantel VanSanten). Will she be seemingly the only person in town who doesn't know that Barry is The Flash? With that complaint out of the way, let’s focus on the positive aspects of The Flash. If everything else about Season Two had been a failure, the series would have been a success because The Flash fights a giant shark called King Shark. Is it cheesy? Of course it is, but it’s a giant shark and it’s awesome. As for the rest of the season, we get more of the elements which make The Flash a successful show. Again, the heart of this show lies in the characters. Barry may be a super hero, but like Spider-Man, he is also a young man who has some very human problems. He has issues with relationships and with family, and the show never shies away from showing Barry getting injured. Barry is put through the wringer on a regular basis and we are always rooting for him. Speaking of relationships, Caitlin gets her own story arc, after she falls for Jay. (Of course, I still think that Barry and Caitlin would make a great couple.) As for Cisco, he begins to realize that Barry isn’t the only one with super-powers. Of course, the show brings us plenty of comic book action as well. Again, the Zoom stuff seems to drag on, but it’s undeniable that this villain has a great look and his battles with The Flash are well done. The show does a nice job of brining in characters from DC Comics. Along with King Shark and the return of Gorilla Grodd, we get appearances by Vandal Savage, Hawkgirl, and Griffin Grey. We also see the re-emergence of Wentworth Miller as Captain Cold. The action sequences stretch the budgetary restraints of a TV show and rarely disappoint or come off as too goofy. I get the fact that The Flash can run super-fast, but how does he navigate. Why doesn’t he plow into something right off the bat? Enough of my nitpicking. The Flash offers action, drama, and laughs, creating a very nice package. Allow me to join the chorus of those who think that it’s ridiculous that Gustin is not playing the character in the Justice League movies. He’s made it his own and he’s earned it. At least we get to see him on this show and I’m looking forward to Season Three. 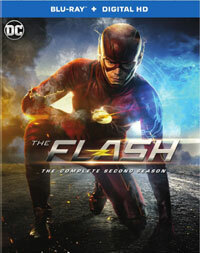 The Flash: The Complete Second Season has The Flash fighting a freakin' giant shark on Blu-ray Disc courtesy of Warner Home Video. The 4-Disc set contains all 23 episodes from the show's second season. The show has been letterboxed at 1.78:1 and the Disc contains an AVC 1080p HD transfer which runs at an average of 16 Mbps. The image is very sharp and clear, showing no notable grain and no defects from the source materials. The colors look very good and the image is never overly dark or bright. The level of detail is quite good and the picture shows nice depth for a TV show. This clearly rivals HD broadcast quality. The Disc carries a DTS-HD Master Audio 5.1 track which runs at 48 kHz and an average of 2.4 Mbps. The track provides clear dialogue and sounds effects. Despite that relatively low bitrate, the track brings us some impressive surround and subwoofer effects, most notably when Barry first begins running. There are also some nice stereo effects which highlight sounds coming from off-screen. "The Flash: Visual Effects - Sticky Situations"
"The Flash: Visual Effects - Superheroes and Villains"